If you are an employer, trainer, group leader or part of a community group looking for something different, we can tailor a volunteer programme to suit your organisation and your particular group. Email us to discuss your needs. We organise conservation workdays for groups of volunteers throughout the year, across the Snowdonia National Park and with a range of themes. The Snowdonia Society can offer single or multiple workdays undertaking tasks from litter picking to gorse clearance, footpath maintenance to dry-stone walling. Each workday takes place in the Snowdonia National Park, often in partnership with other organisations, accessing a multitude of skilled professionals and stunning locations. 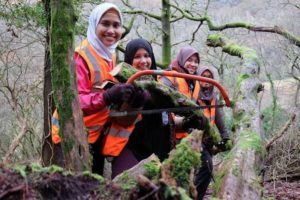 With over 20 years of experience in conducting volunteer workdays, the Snowdonia Society has the networks and experience to deliver safe and rewarding volunteering opportunities that help to protect and enhance the natural environment for people and wildlife. We have worked with Coleg Menai, Ysgol Eirias, IKRAM UK & Eire, First Hydro, CAIS and other community groups to deliver a new learning and team-building experience. We are always eager to forge new partnerships, and we would love to hear from you.